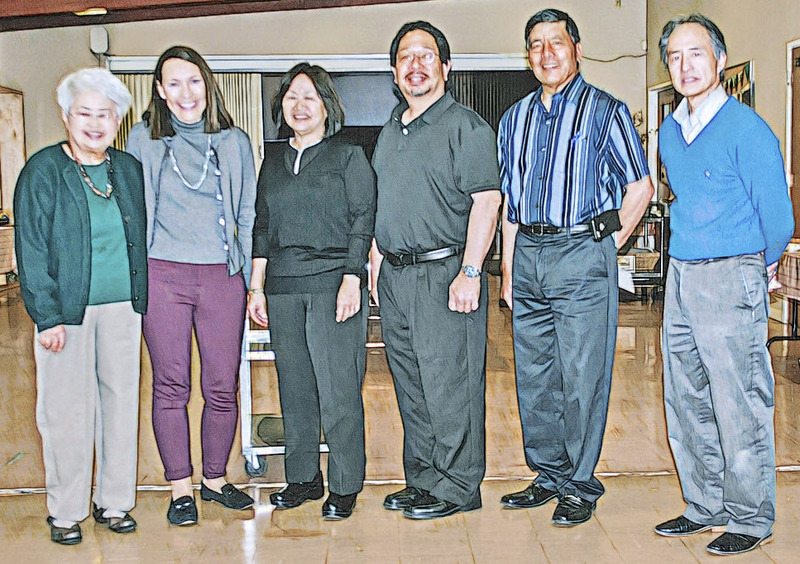 On a warm Saturday afternoon, the French Camp chapter of the Japanese American Citizens League held its 70th annual Installation and New Year’s Luncheon at the Calvary Presbyterian Church in Stockton, Calif., on March 16. The JACL’s French Camp chapter grew out of the Nisei Progressive Society, a group formed after World War II to help rebuild the community and were led by Bob Takahashi, who later became JACL District Governor. In attendance at the luncheon was Katy Komure, a charter member, who still attends board meetings as chapter adviser. During the luncheon, Scholarship Committee Member Dave Furukawa introduced the two high school seniors who were recognized as recipients of the 2019 French Camp Chapter scholarship for their outstanding community service and leadership potential: Kenichi Watanabe and Samuel Liang. Watanabe, the son of Steve and Marissa Watanabe and grandson of the late Seiichi and Sueko Watanabe, is a senior at Whitney High School in Rocklin, Calif., where he played on the soccer team and has been an active member of the California Scholarship Federation and Key Club. He has also served as an assistant coach for his local Special Olympics team and participated in broadcast media activities for his school. As a child, Watanabe attended weekend Japanese school at the Port of Sacramento Japanese school and helped preserve the Asano-Watanabe family tradition of pounding mochi for New Year’s at the family farm. This fall, he plans to study biology at Sierra College to prepare for a career in the biotechnology industry. Liang, the son of Sam and Linda Liang and grandson of Kiyoshi and Mari Hayashi, is a senior at Middle College High School in San Pablo, Calif., where he has already completed 24 units of college credit. He is an active member of the Key Club as well as the Politics and Dance Clubs. Outside of school, Liang enjoys karate, having attained his brown belt. Lastly, he has attended the Buddhist Church from a young age and has received many awards for perfect attendance at Sunday School and held various leadership positions such as Religious Chairperson and Recording Secretary in the Junior Youth Buddhist Assn. Next year, he plans to continue his education at San Joaquin Delta College in preparation for a career in nursing. Former National JACL Secretary/Treasurer and French Camp member Alan Nishi installed the following slate of officers: President Dean Komure, VP Bob Asano, Treasurer Karen Nakamura, Corresponding Secretary Jeannie Matsumoto, Recording Secretary Mary Nakamura and Membership Chair Marcy Wong. For more information on the activities of the French Camp chapter, please email FrenchCampJACL@yahoo.com.